Well, here is a detailed description for all you techno-buffs on jumps - the amazing technology on how and why it is possible to traverse the vastness of space in a matter of minutes. Tacked along are various interesting tidbits on the history of the races and their elusive search for their ancestry. Written by one of the best recognized intellectual in the world of EVE, this is an insightful glimpse into the minds and beliefs of those that live there. 1 - Where do we come from? For centuries men speculated from where mankind came. Today, it has been established beyond reasonable doubt that all the different races and factions found in our part of the galaxy must have originated from a common source. Yet it has proven difficult to piece all the different artifacts together into a coherent picture. In any case, it seems logical from a biological standpoint that humans evolved on the same planet. Even if various differences can be found between and within factions, the likeness in the DNA structure clearly points to a common origin. But then the question is: where is this fabled planet that humans evolved on and how did the human race end up in numerous separate places? A number of ancient jump gates, or fractinos of jump gates, are known to exist in numerous solar systems. Lets look at what we know: It is now undoubted that a race capable of inter-stellar travel roamed our space many thousands of years ago. A number of ancient jump gates, or fractions of jump gates, are known to exist in numerous solar systems. Whether these jump gates were built by our own ancestors or a totally alien race is unknown. These jump gates have some peculiar traits. First of all, age tests have shown that all these jump gates were built within the space of 50 to 100 years. And yet the design of many of the jump gates is a little bit varied between places, like they were constructed by different people. These facts raise many questions: why were they all constructed within this short time-span, and none since? Were they built by the same race, or maybe two or more conflicting races? The answer most favored is that of war. Only a conflict could explain this quick construction of dozens of jump gates and why everything seemed to come to an abrupt halt one day. But who were fighting? And where are the combatants now? It seems highly unlikely that factions capable of inter-stellar warfare suddenly disappear into thin air. By studying the layout of the jump gate remnants, a curious pattern emerges. The jump gates snake out like a spider-web from a central point. And what is the central point? It is the system known to Amarrians, who first found it, as ‘Imlau Eman’, or the ‘Mouth of God’, but is today better known as EVE. The EVE system is an enigma that is still very much a mystery to us. The system itself is not that impressive – just some space debris and a few asteroid belts orbiting a pale white dwarf. But at the outskirts of the system is a phenomenon that has puzzled us for centuries. At the center of this phenomenon lies a huge structure, obviously built by some advanced civilization eons ago. The structure looks very much like a jump gate, except it is many times bigger than any space structure of ours. The gate is fairly plain all around, but there are markings here and there, in some ancient language that has not been fully decrypted. At the top, the largest of these markings is a three-letter word that says EVE. There isn’t full agreement among scholars about the meaning of this word, but most people regard it to be simply the name of the gate. Now, every indication points to this being the gate that our forefathers used to enter this world, but despite massive studies on the gate and the EVE system in whole, we still haven’t uncovered what happened to the gate all these millenniums ago. Extremely bright and powerful electromagnetic turbulence emits from the EVE gate, as it is commonly called. This turbulence seems to originate from within the gate, so it is believed that the gate is actually open and the electromagnetic storms are coming through from wherever the gate is linked to. In any case, the turbulence makes it extremely difficult to study the gate. Fortunately, the storms pulsate rhythmically, meaning that every other year or so they recede enough to allow closer scrutinizing. But even then the turbulence is enough to rip to pieces any vessel foolish enough to wander close to it. The immense brightness emitting from the gate can easily be seen in solar systems close to the EVE system as a vibrating bright star on the night sky. But even in systems in the farthest regions of the known world it can still be seen with the aid of a telescope. The Amarrians, whose home system is only a few light-years from the EVE system, were in the best position to marvel at the gate. Many thousands of years ago, while still on a primitive level, the Amarrians actually coupled the peculiar phenomenon they saw in the sky with their age-old religion and even today the EVE gate holds great importance in the Amarrian state religion. The search for our ancestors goes on. Even if the facts lead us to the EVE system, it seems to be the end of the road. The extensive studies done there over the decades seem no closer to providing the answer to this important question. 2 - The earliest jump gates and the first inter-stellar travelers. Once the Amarr Empire had reached the technology level were it could enter space, it started to vigorously chart their home system. Due to technological limitations this survey took a long time. Finally, the Amarrians stumbled upon the remains of a jump gate at the outskirts of their solar system. By studying the remains, which were more or less intact, the Amarrians were able to garner enough information to build a jump gate of their own. The jump gate was operational but obviously it lacked connections to other jump gates, as it was the only one of its kind. 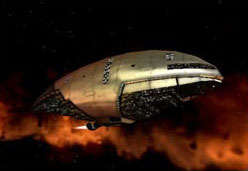 Thus the Amarrians were forced to physically send ships capable of building jump gates between solar systems before a stable wormhole could be formed into the system to connect the two gates. These gate construction ships often took decades to arrive, the crew suspended in cryo-tanks for the duration of the voyage. Only in recent years with the coming of jump drives capable of jumping between systems with no jump gates in them is it possible to overcome this time-consuming prelude to inter-stellar traveling via jump gates and still today dozens of gate construction ships are enroute to a distant system. But patience is a virtue the Amarrians have mastered well and they steadily expanded in every direction from their Amarr home system. Now, more than two millenniums since the construction of their first jump gate, the Amarrians occupy hundreds of solar systems. The Gallentians and the Caldari discovered jump gate technology at relatively the same time. The Gallenteans and the Caldari discovered jump gate technology at relatively the same time, due to the simple fact that their home worlds were then in the same system. This was a little over 700 years ago. The Gallenteans and the Caldari did not enjoy the luxury of finding a relatively intact jump gate relic in their system as the Amarrians did. Instead there were only fragmentary pieces to be found, so they had nothing to build on. Still, these fragments pointed the researchers into the right direction and many jump gate theories were tried out. It wasn’t until after the discovery of a companion brown dwarf, making the system a binary system, that the gate research got on the right track. It wasn’t long after that before the first working jump gate was erected. The Amarr type of jump gate and the Gallente/Caldari one both work on the same principle (see next chapter), but there are some minuscule differences in how the different parts of the gate work exactly. At that time both the Gallente and the Caldari worlds were bursting at the seams and major effort was made in sending ships to nearby systems to build jump gates. At that time both the Gallente and the Caldari worlds were bursting at the seams and major effort was made in sending ships to nearby systems to build jump gates. The mass exodus of the Gallenteans and the Caldari to other systems was nothing like the calm, deliberate expansion of the Amarr Empire, where only one system was colonized at a time and every aspect of the expansion was rigidly controlled by the state. Instead, private firms, the first of the Caldari Corporations among them, were chiefly responsible for surveying systems, sending the constructions ships, and selling the territory to the colonists. In the space of 500 years or so the combined expansion of the Gallenteans and the Caldari had almost equaled the total expansion of the Amarrians in 2000 years. The Jovians are not very forthcoming with information about their technological advances in this regard. Today they employ jump gates functioning on the same principle as the other’s, but nothing is known on where or when the Jovians acquired their jump gate technology. However, they’ve revealed an interesting fact: according to ancient Jovian legends, the Jovians used the ancient jump gates that scatter the world to travel between solar systems a long time ago, before the jump gates crumbled. The legends stay silent about the makers of the gates. 3 - The principles of jump gate technology. These stable wave patterns com in a succession of standing wave patterns, similar to those created on a guitar string. In binary systems there exists strong resonance phenomenons, where the gravitational field of two stars in a stable binary formation would interfere with each other, like ripples from two wave sources. These stable wave patterns come in a succession of standing wave patterns, similar to those created on a guitar string. The strongest resonance is the 1:1 resonance (the first harmonic, so to speak), with two stationary node points situated in the center of each of the two stars. The second strongest resonance is the 1:2 resonance (the second harmonic), where an additional stationary node point appears in the field exactly mid-way between the stars (if of equal mass), and so on for successive resonances. The tip of the tentacle, and for high enough curvature it can eventually induce the creation of a small tentacle in remote high-density regions, taht can reach to the tip and spontaneously combine. The main device of jump gates is a so-called mass boson sphere, based on one of the fundamental physic fields that mediates mass, and thus interacts strongly with gravitational waves. The sphere is filled with mass boson plasma, which reflects gravitational waves, pretty much in the same way as a mirror reflects light. By adjusting the plasma density so that it reflects the high-frequency gravitational waves involved in the dissipation of tensor shear, this radiation is trapped within the sphere, thus leading to a steady net increase of the gravitational stress within the resonance node, which eventually leads to the creation of the high-curvature tentacle. An analogy of this is the laser, which builds up a highly coherent and intense beam of electromagnetic energy by enclosing oscillators within a reflecting cavity. 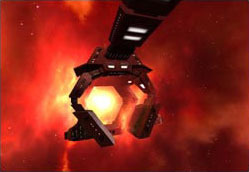 The first jump gate versions built by the Amarrians were limited in the way that once a wormhole had been created and a ship slipped through a new wormhole had to be made before another ships could pass. As it could take several days or even months to re-connect the two jump gates, passing was slow. Later versions of jump gates allowed the jump gates to hold the wormhole open for a longer time and modern day jump gates can keep a wormhole connection open for several dozen years before it has to be reset. Also, the first jump gates were only able to connect and hold a single wormhole at a time but today they can hold several wormholes open at the same time, allowing jump gates to be connected to several other jump gates at once. When the ship goes throught the mass boson sphere, a mono-atomic layer of mass boson gets deposited on the ships surface. 4 - Space vessels get a boost – the first jump drives. Various efforts were made to increase the speed of ships, but most of them failed either because of too high fuel volume and cost, or because they were too limited in scope. 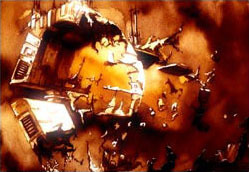 The most successful attempt was that of the old Minmatar Empire, which built acceleration gates that employed gravity in an unique way to slingshot ships between planets. This gave the ships enough momentum to fly between planets in a much shorter time than before. But the Minmatars never discovered how to build inter-stellar jump gates, so their acceleration gates were limited to their home system (where they still exist today). They had begun experimenting with much larger acceleration gates capable of sending ships between solar systems, but they never got a chance to build them before the Amarrians invaded and enslaved the Minmatars. The Amarr Empire itself was slow to make any breakthroughs in this regard, despite their ever-growing space empire. For a long time they made do with ships traveling at ca. 10% of the speed of light, this speed seemed sufficient to them. At last they discovered the principles behind jump drive technology more or less accidentally, while researching new weapon technologies. The first Amarrian jump drive was built nearly 300 years ago. At last the Amarr Empire discovered the principles behind jump drive technology more or less accidentally, while researching new weapon technologies. The situation was different for the Gallenteans and Caldari. Their home planets were in the same system and this meant that intra-system trade runs became an important element in their society right from the outset of their space activity. Thus there was a much greater incentive to find an acceptable solution to intra-system travel. The first jump drive built is the Sotiyo-Urbaata Drive, built by Caldari engineers more than 600 years ago. It was immensely big, tremendously expensive and outrageously inefficient, but it worked. 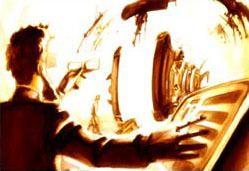 The Sotiyo-Urbaata Drive, along with later versions, sped considerably up the social and technological development for both the Gallenteans and the Caldari and is without a doubt one of the most important discoveries ever made. Since their first appearance all these long centuries ago, jump drives have become ever more advanced, making them cheaper, more reliable and more efficient. Yet the difference between the Sotiyo-Urbaata Drive and a modern day drive is not so great; both work on the same underlying principle, both allow very fast travel within the solar system. But the latest versions of jump drives are for many the true jump drives, for they allow ships to traverse solar systems even where there are no jump gates. These revolutionary jump drives, which are still relatively rare and expensive, combine traditional jump drive technology with jump gate technology and create a whole new piece of equipment. 5 - Faster-than-light travel – how? So what is the elusive answer to FTL travel? 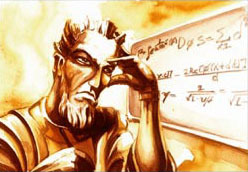 It was found through advanced research in the field of quantum electrodynamics. By creating depleted vacuum, that is, vacuum as found in space but completely stripped of all energy, and then expanding this depleted vacuum to envelop a ship, the ship is capable of moving faster than light through this bubble of depleted vacuum. A depleted vacuum bubble is more than frictionless – it is so anti-friction that things (including light) actually move faster in it than they would in complete vacuum. The jump drive creates depleted vacum by repeatedly 'compressing' vaccum between two polar dishes, draining all energy neutrons and quarks out of it. All space ships are equipped with a jump drive device. The jump drive creates depleted vacuum by repeatedly ‘compressing’ vacuum between two polar discs, draining all energy neutrons and quarks out of it. A laser-locked field is then created to hold the ever-increasing depleted vacuum bubble until it has enveloped the whole ship. When that happens the ship is able to enter FTL speed. Although initial experiments with the jump drive were very encouraging technology wise, problems arose in regard to navigation. Once the ship has attained FTL speed, it is very difficult for it to act or react to the world, such as for communication or scanning purposes. Numerous experiments were made, for example with compactified dimensions radio, but without success. The unpredictable nature of quantum mechanics made it very difficult to create a stable enough vacuum bubbles to allow for precise time measurements due to fluctuating speeds. Finally, a solution was found. It was discovered that gravity capacitors similar to the control system used in jump gates were able to pick up gravity signals from ‘normal’ space while the ship was on FTL speed. By locking the capacitor onto one of these signals, the ship travels to it. The bubble is then automatically dispersed once certain distance from the gravity well is acquired. The only problem is that these capacitors can only efficiently pick up signals from gravity wells of certain size or above, with the minimum being a small moon or a cluster of asteroids. Also, in order for the gravity capacitor to align correctly on the destination object in relevance to the position of the sun, it must follow a relatively narrow route towards it, resulting in a fairly restricted emerge area for the ship. This puts some limits on the jump drive’s usage, but as all major objects in a system can be detected, this is not such a great problem. Furthermore, it is now possible to construct ‘fake’ gravity wells on space stations and jump gates, which can be detected and thus homed onto by the gravity capacitor that is part of a ship’s jump drive. Further research into jump drives, especially those aimed at amalgamating the technology used for jump drives and the one used for jump gates, has led to more and more advanced jump drives becoming available. It is now possible to fit a ship with a jump drive capable of inter-stellar travel. The first versions of these allowed the jump drive to connect to a jump gate in another solar system and jump to it just as if the ship had moved through a jump gate. 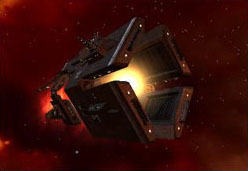 The later versions allow ships to jump from a system with a jump gate to another system that has no jump gate, and the latest version, still only available as a prototype, allows a ship to jump between systems even if no jump gate exists in either system. The first versions of these drives simply aligned the drive with the nearest resonance node in the system (often using nodes 1:4 or even 1:5), then created instant mini-wormholes through it for just enough time for the ship to slip through. More advanced versions, allowing jumps into systems with no jump gates, are a bit more complex. They send out a constant barrage of high frequency neutron rays, based on the flat-space principle of trans-relativistic physics, through infinitesimal cosmic strings to scout out the destination system. This survey can last for several days before enough data is gathered to allow the ship to create a wormhole (through a resonance node of course) to the destination system. 6 - About the author. Alain Embrosius Topher has a degree in applied physics and experimental psychology from the Caille University on Gallente Prime. Topher, a brilliant but unruly student, signed up with an exploration company after his graduation and spent the next twenty years roaming around remote solar systems, collecting astrophysical data. He has always been enthusiastic about foreign and alien cultures and the main reason for his exploration scurries was the hope to discover alien artifacts. Until now he has not found any artifacts older than a few thousand years old and all which are of obvious human origin. Having amassed a sizeable sum during his days with the exploration company, Topher finally decided to try his luck on his own and spent the next few years combing several promising systems. Working alone, or at most with a couple of assistants, made these excursions highly dangerous, and thus prime entertainment material. Topher made a deal with one of the largest entertainment network in the Gallente Federation to make vid programs about his adventures. These became hugely popular for a while, but the lack of bug-eyed monsters or glittering treasures soon turned the public indifferent. Topher, who had thrived in the limelight, decided to shelve his excursions for a while in favor of taking more exciting (and lucrative) excursions in vid studios. Topher was content to live the life of a vid star for some years, but in the end the scientist in him begged for attention. Feeling too old to start running around barren planets again, Topher settled instead on making education shows and info clips, often in the form of games of some sort. Yet again he hit the jackpot and for billions of Gallenteans Topher is a household name associated with education and knowledge. Now in his early nineties, Topher is finally settling down to a quiet academic life. His vid appearances are now few and far between and instead he’s focusing on pure science, more or less for the first time in his life. Long regarded as a stylish quack with a lot of weird ideas among his fellow scientists, his recent studies and papers has earned him long-overdue respect from many of his peers.